Please note that above price is subjected to change and is for reference purpose only. Kindly contact Tata Nepal to get the latest showroom price. Note: Tata car price list was last updated on February 12, 2019. Tata motors cars & utility vehicles in Nepal are distributed by Sipradi Trading Private Limited (STPL). STPL is one of the largest automobile distributors in Nepal. Sipradi Trading sells all type of utility vehicles & cars of Tata, be it passenger or commercial. Tata Motors, in partnership with Sipradi, started exporting commercial vehicles to Nepal in 1982. Buses and trucks were dominantly used in Nepal. Import of passenger vehicles of Tata in Nepal started from 2003. As of now, Tata motors has significant share of more than 70% of the total automobile industry in Nepal. Also, it is one of the top three in passenger vehicle segment. Nepal is considered one the important market for Tata automobiles & cars. With its strong sales and service distribution network, Sipradi Trading has been able to serve full range of Tata motors automobiles. Tata are focused more on products and processes that are environment friendly. They have been working with alternative fuels, electric & hybrid motor vehicles for personal, public and commercial use. They use some of the world’s most advanced technology and system to check and control emissions. 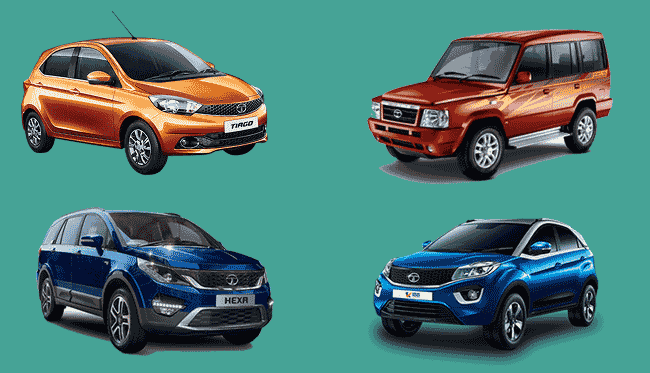 Tata in Nepal is currently selling 8 models of passenger cars and vehicles which includes Bolt, Hexa, Nexon, Storme, Sumo, Tiago, Tigor and Zest. In pickup commercial utility vehicles, it has Tata Xenon and Yodha. Passenger Tata cars starts at price of around Rs. 25 Lakhs in Nepal and goes upto Rs. 91.5 Lakhs. Or you can message us your queries regarding Tata car price in Nepal or its specifications at our Facebook page.